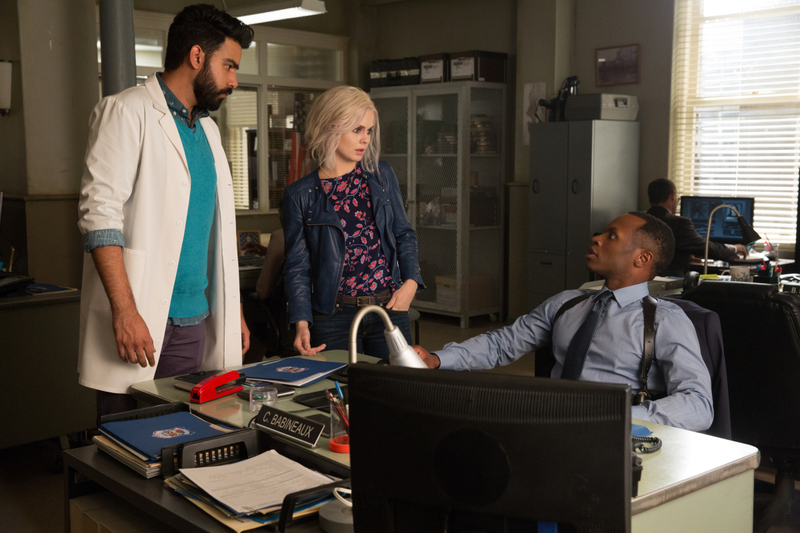 Episode 3.02 “Zombie Knows Best” — When Liv (Rose McIver), Clive (Malcolm Goodwin) and Ravi (Rahul Kohli) arrive at the scene to investigate a fatal car accident, they begin to suspect foul play was involved. Both starving, Liv and Major (Robert Buckley) consume the brains of the accident victims, a well-meaning father and his angsty teenage daughter. Meanwhile, when Clive is brought in for questioning about a family that was murdered, he’s forced to reveal his past history with them. Lastly, Peyton (Aly Michalka) extends an olive branch to Ravi (Rahul Kohli), and Major hits a road block in his search for Natalie (guest star Brooke Lyons “The Affair”). David Anders also stars. Jason Bloom directed the episode written by Diane Ruggiero-Wright. Air Date: Tuesday, April 11 (9:00-10:00 p.m. ET) on the CW. iZombie -- "Zombie Knows Best" -- Image Number: ZMB302a_1790.jpg -- Pictured (L-R): Rahul Kohli as Ravi, Rose McIver as Liv and Malcolm Goodwin as Clive -- Photo: Jack Rowand/The CW -- ÃÂ© 2016 The CW Network, LLC. All rights reserved.